What started off as a big, colourless construction site at the beginning of the project, turned into a holistic-rehabilitation centre called OSLONAC (Support) in Stara Pazova, a small town near Belgrade, welcoming everyone in need of assistance in the area of health, education, skills development and the strengthening of social inclusion. The Centre has been established, constructed and equipped thanks to joint “forces” of the local self-government and the EU, within the project “Development of innovative community-based social services for vulnerable groups in Stara Pazova.” The project was largely funded by the EU (85%) whereas the rest of the money was allocated by the Municipality of Stara Pazova. Implemented within a wider project “European Union Support for Social Inclusion” worth €5.4 million, the total value of the project stands at €232,812.88. OSLONAC is now painted in lively colours chosen by its youngest beneficiaries. The services provided at the Centre, and the Centre itself, are aimed at children with developmental disabilities: those are pupils of the Elementary School for Children with Disabilities Anton Skala, as well as pupils from other schools in the municipality who already receive support of special education teacher, but need additional sensory stimulation in their treatments. Thanks to the project, the local community has obtained an innovative social protection service for young people and children with disabilities which respects the needs of beneficiaries and reduces the need for custodial care. In parallel, the developed service ensures observance of beneficiaries’ rights in terms of support they need in order to live in their natural surroundings. The Centre’s beneficiaries are aged 3-26. At the beginning of the project, 98 children and young persons with different disabilities (e.g. attention deficit disorder or various types of sensory impairments) from the Municipality of Stara Pazova had been identified as potential users of community-based social services. 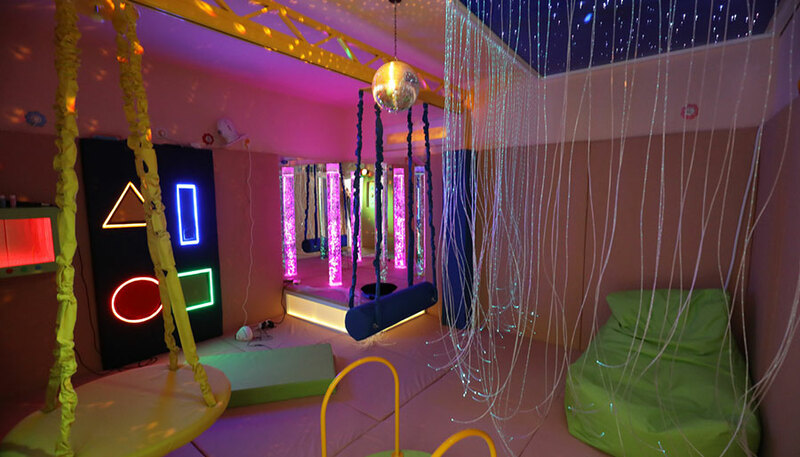 The Centre offers various forms of therapy: sensory therapy (“sensory room”, “white room”) and halo-therapy (“salt room”). 30 children and young people who have so far benefitted from the services offered by the Centre describe the experience at the Centre as enjoyable. 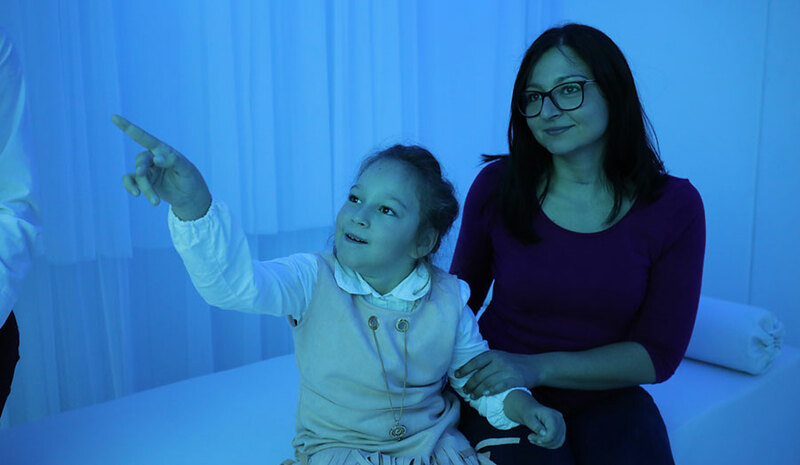 Slavica, one of the girls who visit the Centre, says that she likes “going to the sensory room.” “It’s like a space ship: dark and glittery, with lots of blinking toys. I sometimes pretend I am at a disco and romp around; other times I lie down and watch the ceiling which looks likea starry sky. Then the teacher reads a nice fairy-tale or plays a song about a star which shone in the sky and then fell in love. This is the only dark I am not afraid of,” she says. Slat room is an auxiliary treatment method which reduces the need for medication. It soothes the nervous system and, due to its pleasant and creative atmosphere, allows children to improve their general health condition through fun and play. Therapists at the Centre encourage children and young people to move constantly during their stay in therapy rooms in order to stimulate their senses. The Centre hired seven new professionals – four special education teachers, a psychologist, a pedagogue and a paediatrician. They have undergone five trainings/workshops in specific forms of sensory therapy and sensory room activities. Once the project is completed, Stara Pazova will continue to fund services aimed at the most vulnerable children and young people with disabilities living in the territory of the municipality. As for the rest of the users and people who wish to promote their physical and mental health, they will be offered individualised treatment plans. As a result, the project will ensure not only the well-being of young people with disabilities, but also of the community as a whole. This action is part of a wider project “European Union Support for Inclusive Society,” which ran from beginning of 2015 to November 2017. The European Union has donated over €5.4 million in support of measures in the area of social inclusion aimed at increasing both scope and quality of community-based social services for the vulnerable and other groups in a difficult position, including the Roma. In consequence, end users of the project are the citizens of Serbia – beneficiaries of the social protection system, members of the Roma national minority and other vulnerable groups. In total, 28 projects have received funding: 18 projects in the area of community-based social services for the vulnerable; and 10 projects in the field of active social inclusion of the Roma. The projects have been successfully implemented by municipalities, centres for social work and NGOs in 76 towns and municipalities, bringing direct benefitsto more than 10,000 people. The project of introducing the Roma language as an optional subject in elementary schools in Serbia stands out among the rest in the area of active social inclusion of the Roma. It has yielded remarkable results: the Roma language is now being taught as an optional subject in 75 schools – some 3,000 pupils in 43 municipalities across Serbia say they are interested in learning the language. 47 teachers and pedagogical assistants have undergone training in the subject. In September 2016, they were awarded certificates of the Roma language and culture which allow them to teach in schools. Also, a Roma language textbook and a special publication about the history of the Roma language with guidelines for teachers are being produced. All activities are implemented with a view to advancing education of young Roma and their social inclusion.